Last Wednesday I attended #FireStarters, an event asking UK agencies how they are innovating. Generally agencies have straplines and About us pages using the words: Innovators, Cutting edge technologists, Modern thinkers, at the fore front… and other synonyms. I wanted to know how they keep looking for innovative ways to do things. Firestarters started (redundant to say) on 2011 when Google asked Neil Perkin, my professor at the Masters, to curate a series of events designed to encourage thinking and debate around challenges that planners are facing. Since then it has been happening several times a year, I attended the #FireStarters No. 8. First of all, being at Google HQ in London brings you to a different world, the design is amazing and all the rooms have their own personality, we were at the Town hall. The place was designed by architecture studios PENSON. Focusing on our topic, the talks began. First on the podium was Pats McDonald, Chief Strategy Officer at Isobar, asking for innovation not only in environments and culture but in business models. She spoke about the rise of LABS in agencies and ways to disrupt the current model, a very complete presentation indeed. It is nice when you see in person people that you follow on Twitter, that happened to me when I saw @anjali28 taking the mic. Anjali Ramachandran was debating innovation in different contexts: product, process, marketing and organizational. Remarking that agencies can’t be classified as ‘innovative’, this will reduce the perspective and the impact. Following was Antony Mayfield, founder of Brilliant Noise, whose advice was simple: Quit you job and do something outside of the agency so you won’t be prisoner to its business model. He also presented the Netflix case inventing the future of an industry not just focusing on the future of the DVD rental business. Netflix is transcending, looking at where the consumer is heading to and this is what agencies should look at too. Then, Phil Adams from Blonde Digital, brought some meaningful thoughts, underlining how agencies are in a race to create apps and hashtags like they are in Foursquare, (funny). Phil emphasized that innovation shouldn’t been pointless, it should be done for a purpose. Are we using it as an ‘Ends’ or as a ‘Means’? think about it. Beeker Northam the brain behind the Govt Digital Service, told us a bit about her life, her fear of having twins and the reality when you run your own agency. Innovation becomes a small part of the budget, while most of the money goes on rent and salaries. I’d never heard of KLF, until Glyn Britton told us about the book he recently read ‘KLF: Chaos Magic Music Money’ – to give you an idea, these guys ‘retired’ from the music business, firing a machine gun at music execs at the Brit Awards, before dumping a dead sheep on the steps of the after party. And finally they burnt their last million quid – all the money that was left over from their pop career. Crazy right? They didn’t know what they were doing. they just look like they did. Sometimes this is true of agencies too. Graeme Wood, Planning Director at LBi, explained how planners can inspire innovative behavior in agencies. Now I’m feeling like reading some of the books he mentioned: “I’ ll have what she is having” and “Thinking fast and slow” (my husband has been recommending them to me for a while – but I don’t trust his opinion). Lastly, a great speaker closed the event: Nadya Powell, with a sincere talk about her job title as Chief Innovation Officer at Dare, she discussed the need of collaboration in this area and invited us all to join @InnovationSoc in the pursuuit of innovation. 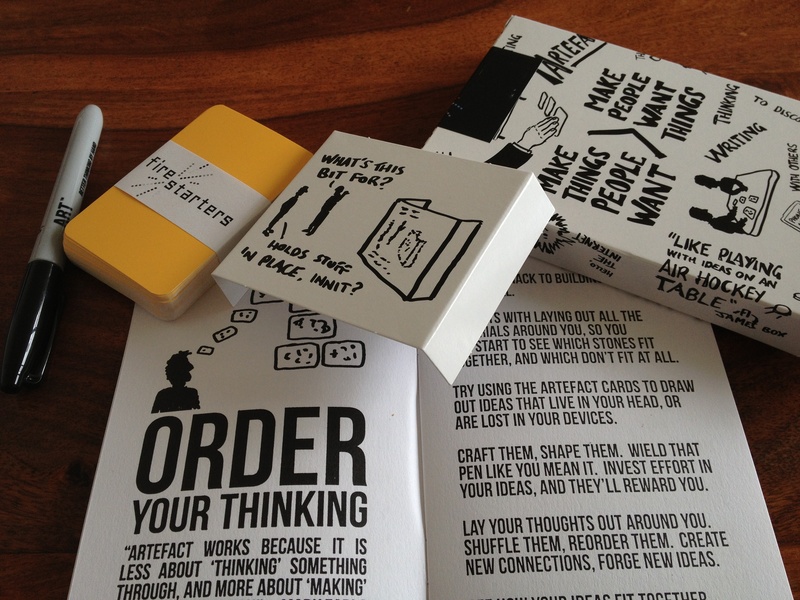 I got a great souvenir, Artefact cards designed by Smithery for drafting and crafting ideas. Love it! Ooof!! this is one of the longest post I’ve written, but I didn’t want to miss any speaker or any point, all ideas are valuable, they are just like a bunch of rocks and sticks, ready to start the fire.